Here’s how to be the coolest grandparent on the block and get your grandkids to look up from their phones or tablets and actually interact with you. Written by a professional magician who knows that everyone, no matter how young or old, is craving something real, something live, something special, Grandpa Magic is a collection of 112 easy-to-master tricks, stunts, and brainteasers that will engage and tickle grandkids of every age (like the little ones who will greet any trick with jaw-dropping amazement, and the older ones who already know Santa doesn’t exist and will hound you to tell them how you did it). It starts with the age-old trick of pulling an object out of thin air and moves on to tricks with straws - up your nose and out your mouth; coins - make several pennies melt through your grandchild’s hand; cards, including a mind-reading trick. There are dining table tricks (Bounce a Dinner Roll off the Floor), mental mysteries, the Floating Finger illusion, and a three-act show that grandparents and grandkids can perform together. A third section of the book is filled with visual puzzles, challenges, and brainteasers - The Mountain Climber Problem, The Impossible Knot, The Elevator Enigma - that require no physical dexterity and yet will keep your young audience rapt. Step-by-step illustrations will show even the most novice of grandparents how to pull it all off flawlessly, and be dazzling in no time. 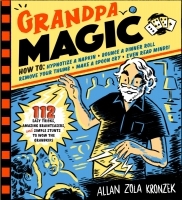 From a professional magician, 100 tricks, stunts, and brainteasers that will engage the grandchildren and provide giggles, jaw-dropping awe, and wonderful memories. From the old pull-a-quarter-from-behind-a-kid's-ear trick and 'removing your thumb' to card tricks, stunts for the dinner table, and verbal puzzles that surprise and delight, these tricks are illustrated step-by-step so they're easy to learn and guaranteed to make grand parenting even more fun.